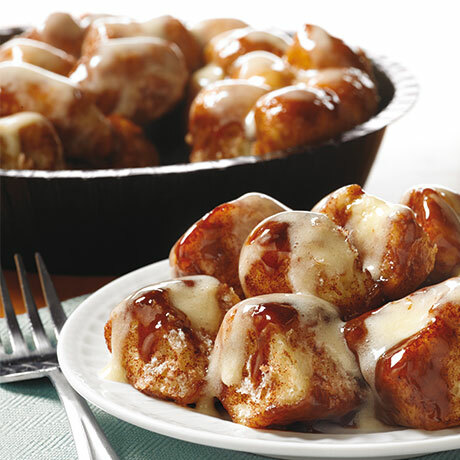 Enjoy delicious sweet dough bites made with our famous cinnamon and signature cream cheese frosting. Warm and ready to eat in minutes. Contains one 17-ounce bowl of Cinnabon Gooey Bites. Serves three. Bread: Enriched Wheat Flour (Wheat flour, Malted Barley Flour, Niacin, Reduced Iron, Thiamine Mononitrate, Riboflavin, Folic Acid), Water, Unsalted Butter (Pasteurized Cream), Sugar, Nonfat Dry Milk, Contains 2% or Less of: Enriched Wheat Flour (Wheat Flour, Niacin, Ferrous Sulfate, Thiamine Mononitrate, Riboflavin, Folic Acid), Corn Syrup Solids, Oat Fiber, Sodium Stearoyl Lactylate (SSL), Monoglycerides, Sodium Alginate, Yeast, Ascorbic Acid), Wheat Flour, Xanthan Gum, Enzymes, Salt, Dough Conditioner Blend (Wheat Flour, Calcium Sulfate, Salt, Enzymes), Potassium Sorbate (Preservative). Caramel Topping Blend: Corn Syrup, High Fructose Corn Syrup, Sugar, Butter, Cream, Nonfat Dry Milk, Modified Food Starch, Salt Soy Lecithin, Mono-and Diglycerides, Sodium Bicarbonate, Natural and Artificial Flavour, Brown Sugar (Sugar, Molasses), Vegetable Liquid Margarine (Liquid and Hydrogenated Soybean Oil, Water, Salt, Contains Less Than 2% of: Vegetable Mono & Diglycerides, Soy Lecithin, Sodium Benzoate [A Preservative], Citric Acid, Natural & Artificial Flavor, Calcium Disodium EDTA added to protect flavor, Beta Carotene [Color], Vitamin A Palmitate), Cinnamon. Cinnamon Sugar Blend: Sugar, Cinnamon. Cream Cheese Frosting: Sugar, Cream Cheese (Pasteurized Milk and Cream, Cultures, Salt, Xanthan Gum and/or Guar Gum and/or Locust Bean Gum), Margarine (Palm Oil, Water, Soybean Oil, Salt, Mono and Diglycerides, Whey Solids, Soy Lecithin, Sodium Benzoate [To Preserve Freshness], Natural flavor, Vitamin A Palmitate), Corn Syrup Solids, Water, Contains Less Than 2% of: Soybean Oil, Artificial Flavor, Potassium Sorbate (To Preserve Freshness), Guar Gum, Xanthan Gum, Lactic Acid, Cellulose Gum, Yellow 5 (Artificial Color), Beta Carotene (Color). Vegetable Liquid Margarine: Liquid And Hydrogenated Soybean Oil, Water, Salt, Contains Less Than 2% of Vegetable Mono & Diglycerides, Soy Lecithin, Sodium Benzoate [A Preservative], Citric Acid, Natural & Artificial Flavor, Calcium Disodium Edta Added To Protect Flavor, Beta Carotene [Color], Vitamin A Palmitate.